A, Height of hippocampus; C, Width of choroidal fissure; D, Width of temporal horn. 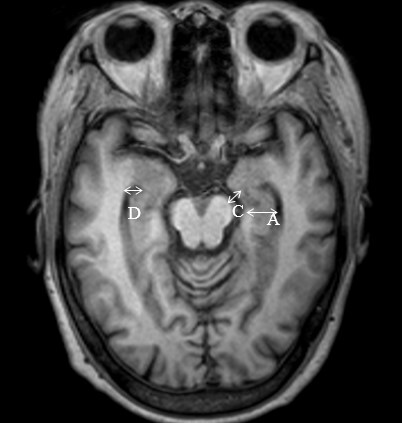 Deep white matter (DWM, D rating) based on the longest diameter of the lesions. - Periventricular white matter와의 구분 위해 ventricle의 lateral wall쪽으로는 normal appearing white matter를 사이에 두고 있어야 한다. - Upper margin을 측정 시 마지막 ventricle이 보인 후 위로 두번째 cut (1cm)에서 보이는 white matter change를 grading한다. Periventricular white matter (PWM, P rating) based on the size of the cap and band. - banding 은 horizontal axis로 가장 큰 diameter를 측정한다. 1. Scheltens PH, Leys D, Barkhof F, Huglo D, Weinstein HC, Vermersch P, et al. Atrophy of medial temporal lobes on MRI in" probable" Alzheimer’s disease and normal ageing: diagnostic value and neuropsychological correlates. J Neurol Neurosurg Psychiatry. 1992;55(10):967–972. 2. Kim GH, Kim J-E, Choi K-G, Lim SM, Lee J-M, Na DL, et al. T1-weighted axial visual rating scale for an assessment of medial temporal atrophy in Alzheimer’s disease. J Alzheimers Dis. 2014;41(1):169–178. 3. Koedam ELGE, Lehmann M, van der Flier WM, Scheltens P, Pijnenburg YAL, Fox N, et al. 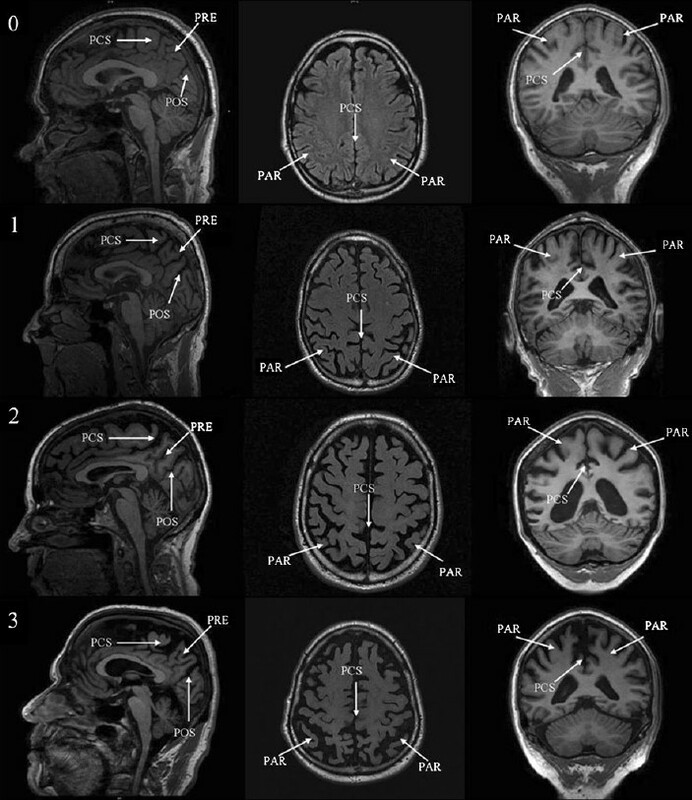 Visual assessment of posterior atrophy development of a MRI rating scale. Eur Radiol. 2011 Dec;21(12):2618–25. 4. Pasquier F, Leys D, Weerts JG, Mounier-Vehier F, Barkhof F, Scheltens P. Inter- and intraobserver reproducibility of cerebral atrophy assessment on MRI scans with hemispheric infarcts. Eur Neurol. 1996;36(5):268–72. 5. Harper L, Barkhof F, Fox NC, Schott JM. Using visual rating to diagnose dementia: a critical evaluation of MRI atrophy scales. J Neurol Neurosurg Psychiatry. 2015 Nov;86(11):1225–33. 6. Park HK, Na DL, Han SH, Kim JY, Cheong HK, Kim SY, et al. Clinical characteristics of a nationwide hospital-based registry of mild-to-moderate Alzheimer’s disease patients in Korea: a CREDOS (Clinical Research Center for Dementia of South Korea) study. J Korean Med Sci. 2011 Sep;26(9):1219–26. 7. Fazekas F, Chawluk JB, Alavi A, Hurtig HI, Zimmerman RA. MR signal abnormalities at 1.5 T in Alzheimer’s dementia and normal aging. AJR Am J Roentgenol. 1987 Aug;149(2):351–6. 8. Noh Y, Lee Y, Seo SW, Jeong JH, Choi SH, Back JH, et al. A New Classification System for Ischemia Using a Combination of Deep and Periventricular White Matter Hyperintensities. J Stroke Cerebrovasc Dis. 2014 Apr;23(4):636–42.